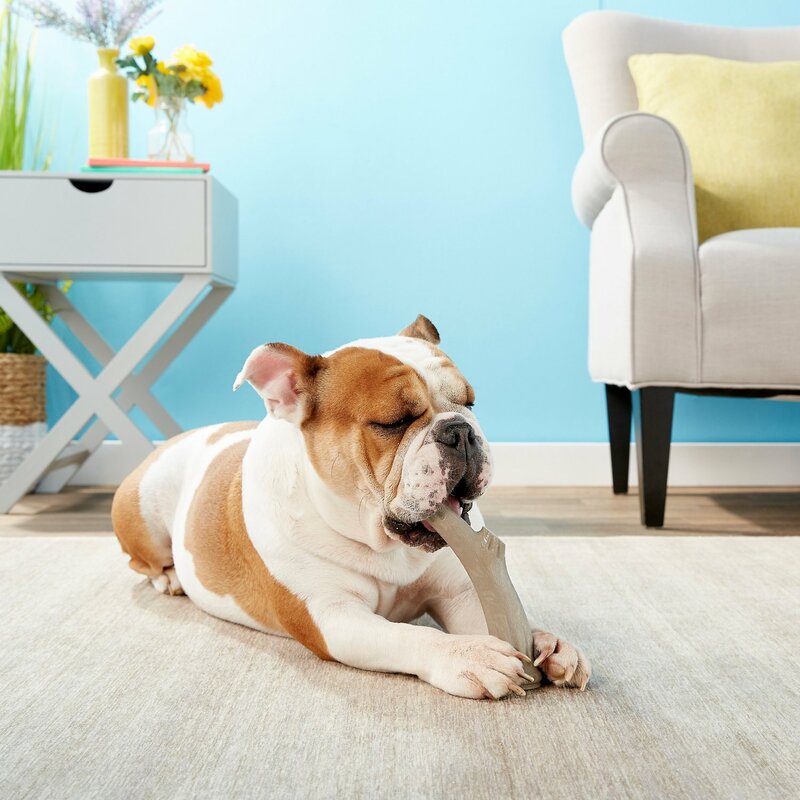 Help fulfill your dog’s natural desire to chew with Petstages Elkridge Dog Toy. This innovative chew toy is made of nylon and naturally shed antler. This unique combination provides your pup with the natural antler taste he loves and helps to keep him safe since he doesn’t have to worry about it splitting or splintering like a real antler. And you can feel good knowing that all the materials are 100% non-toxic. Petstages Elkridge Dog Toy helps keep your companion busy and keeps his pearly whites nice and clean as he chomps. 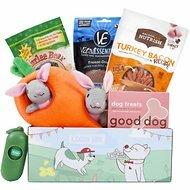 Whether your companion wants to play a game of toss and fetch or sit and chew, this one-of-a-kind toy is sure to satisfy his chewing instincts! Combines real antler with synthetic strength for an innovative chew your dog won’t be able to resist. Safer than real antlers—no splintering and no dirty mess. Designed with various textures to help clean your canine’s teeth and gums. Available in multiple sizes for adult dogs of all breeds. Proudly made in the USA with a non-toxic material for a toy you can trust. I have 2 pups (setter and lab) less than 1 yr. of age. Both are power chewers! They loved our 'real' deer antler which became small and unsafe, so I needed to find an tasty substitute. Both pups love it, and initiate a game of chase over it. I'll be ordering another one soon. My almost 6 months old shepherd mix loves chew toys from Petstages (Deerhorn & NewHide), so I thought I'd give this a try. She LOVES it! This one as well as Deerhorn & NewHide have nice texture (not slippery) so that she can have a good grip while chewing. Thanks! Pet stages makes awesome products! This Elkridge dog toy is not an exception. From the time I opened the package, my little fur baby was intrigued. When he chews on this it gives a little bit. There’s teeth marks in the toy. This is very important, as I don’t want him chewing on anything so hard that it does not give at all. This will cause him to have broken teeth. Don’t hesitate, this is a definite winner. My pit mix loves this toy. Its lasting pretty well, seema marginally more durable than a real antler but she's definitely still making her way through it. When we adopted her we were told she was obsessed with antler chews so we spent 30$ on a real one that lasted a week. This one is obviously more cost effective but it's hard plastic and makes me worry about her teeth. I bought her another real one and she wont play with it! Now she only wants this one! I have an 8 month old goldendoodle and this is his favorite chew toy. We have probably tried 20 different ones to keep our puppy from chewing on other things and it’s his favorite by far. My sister’s dog loves it too! We finally found a chew toy for The Moose! We were tired of buying chew toys that our dog could destroy within the first 15 minutes. He’s had the Ellridge dog toy for over a week now and it’s still going strong. Thank you, Chewy!! Finally something for her to chew on that's lasted longer than an hour. She's had it about 2 weeks and it's still going strong. I have two big dogs and one medium dog. They just can’t wait for me to give them there antler chew toy. What is good it takes time to shrink.